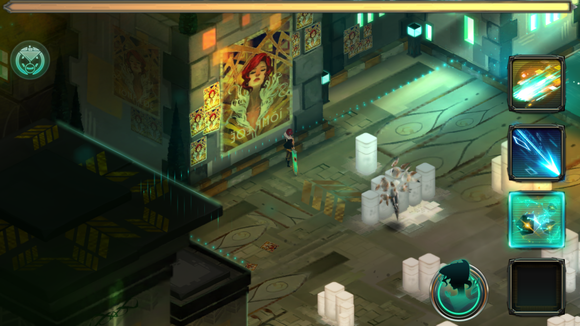 With epic boss fights and powerful enemies, Transistor's villains make it a standout RPG. Let’s hear it for the villains. The bad guys. The nefarious forces you have to defeat to ultimately complete a game. It wasn’t until I played Transistor, a cyberpunk action-adventure game from Supergiant Games, that I appreciated why I’ve found so many other mobile titles’ world’s lacking: They have forgettable bad guys. 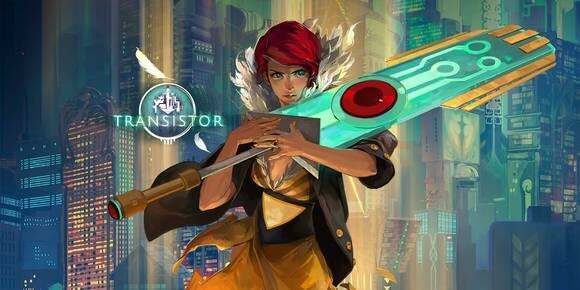 But Transistor, a lovingly-made and original vision of the future, reveals the parties responsible for stealing your voice and trapping your friend’s soul in your sword in the first few minutes. All four conspirators share a similar bourgeois arrogance and white, black, and red color scheme—it makes them immediately identifiable and not just a little bit cool. As you soon as you meet them, the game is about stopping their plans for your city and getting revenge. Aside from the villains, here are three other reasons why you should play Transistor. You can load different attacks into different slots, but be warned—you have a max “memory” for the weapon, so later on, you’ll have to be more selective. Engrossing world: While you’re off on your quest for revenge, Supergiant Games does little else in terms of telling you the story. Instead, by interacting with the green and orange cityscape, you begin to understand the world around you. While the gameplay is somewhat linear, you still feel part of a huge complex city. There are bars, skyways, backdoors, and secret passages. Just as the protagonist, Red, is confused by the state of things—why did the villain’s attack her? Why does she have this weapon?—the player is similarly adrift in this mysterious world. You begin to get answers not through the silent Red, but through the sword speaking to you and the various clues you pick up along the way. The game isn’t completely linear, and if you’re not careful, you’ll miss out on some of the hidden areas and challenges. Complex but unique combat system: The hands-off, “show, don’t tell” approach also applies to the combat mechanics. Red has the ability to pause and plan her next moves (called “Turn” in the game’s lingo) and can then deploy some of the attacks that have been loaded on her sword. Like any good RPG, a lot of these moves can be augmented or combined, and there’s a great incentive for trial and error by learning the best combinations for the different attacks. As an example, it took me a while to learn that my dash attack was much more effective when it left cloned images behind me, confusing my enemies. It takes time for Turn to recharge, however, so you’ll also need to stay alive or attack in real-time: You’ll often be forced to choose which enemies are the highest priority targets and then use various maneuvers to outrun the surviving forces’ attacks on you. Interestingly, if you run out of health, you’ll lose access to one of your loaded attacks (it will eventually return as you progress). 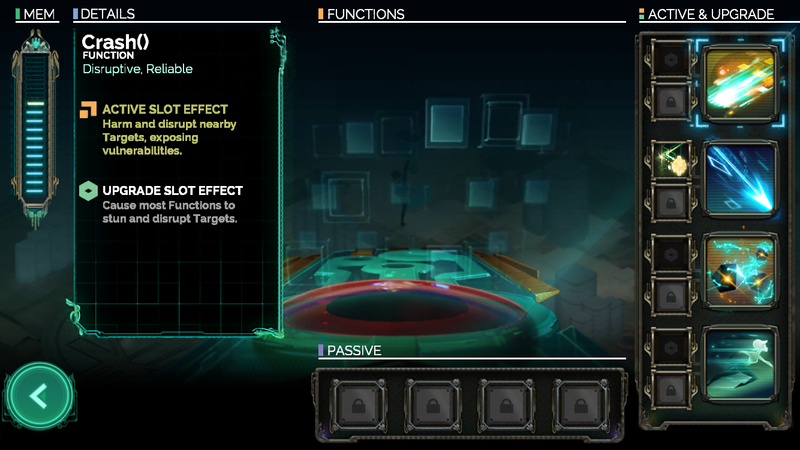 So when you die, instead of restarting at a checkpoint, Transistor’s hobbles your attacks, making it harder to progress. Several intense fights made me feel like the Black Knight from Monty Python by the end. Your enemies will often decimate you if they have line of sight. Sneaking around behind them or blocking them is essential to progress. No grind, but plenty of challenge: Unlike many RPGs, there really isn’t a focus on level-grinding here. If you find the challenge is too easy, you can always add “limiters” which, like the powers you acquire, can be loaded into your sword. Essentially, these make your enemies more powerful and up the challenge while increasing the level-finishing bonus score. Your enemies are designed to keep you on your toes, too: They’re a diverse group of robotic creations called “the Process” that can quickly overwhelm you with their powerful abilities. There are also some absolutely epic boss fights, including one giant leviathan whose tail whips out and attacks you from various places throughout the level. The levels get harder and harder to complete, and more importantly, nothing feels redundant. 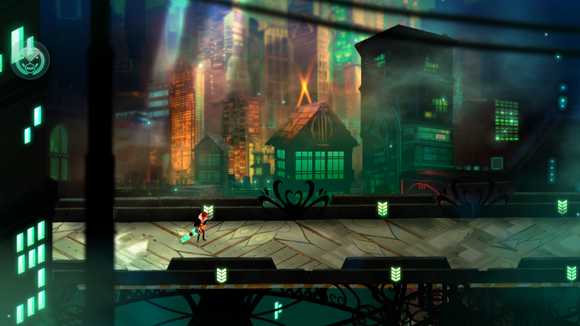 Transistor does a good job of making you feel like part of a larger world. Supergiant Games is most known for Bastion, a similarly ambitious and beautiful title available for consoles and Macs. While the two games are very different, both share a real attention to detail: The developers put a lot of thought into oft-forgotten elements like storytelling, background design, and a uniform aesthetic. 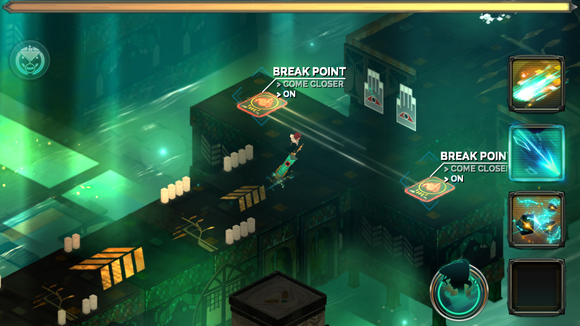 Transistor is an unsettling, fun, and subtly cool action RPG that should be your next download on iOS.